Merkle-Korff Industries AC Single Phase Parallel Shaft Gearmotors » Electronic Salesmasters Inc.
Used in everything from boilers to security systems, these gearmotors can run on intermittent or continuous duty cycles and have needle bearings for high radial loads. 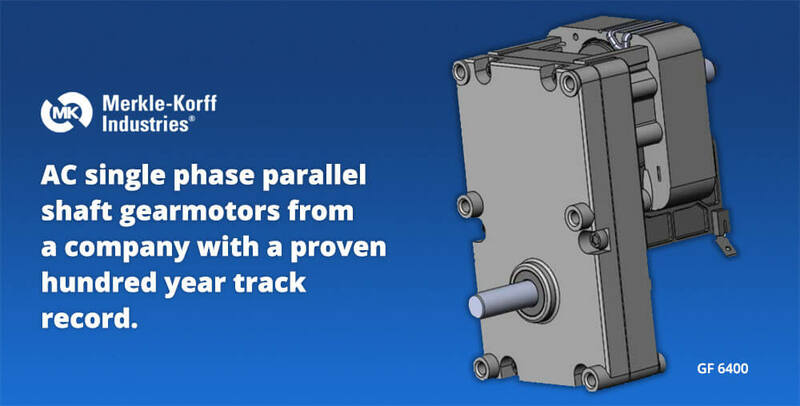 From its simple beginning as a specialty machine shop to producing transmissions for Model A Fords — and combining small motors with speed reducers to create the first gearmotor — Merkle-Korff has a 100-year track record of designing and producing customized applications for its customers. We are honored to serve as a manufacturer’s rep for Merkle-Korff Industries, an industry leader in brushless, PMDC and AC gearmotor and motor and control solutions for applications in commercial food equipment, consumer appliance, vending, pellet stove, pump, medical and other markets. A pioneer in the development of small motors and gear motors known as “sub-fractionals,” the Merkle-Korff brand has contributed to the success of countless commercial, industrial and consumer products since its founding in 1911.